(2XL) BIG MAN Vintage 70s Disco Shirt! Off-White & Blue Miniature Windowpane Plaid! Home > 1970s Disco Clothing > BIG MAN Clothing (2XL +) > (2XL) BIG MAN Vintage 70s Disco Shirt! 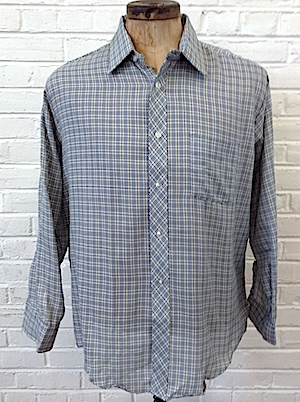 Off-White & Blue Miniature Windowpane Plaid! BIG MAN vintage 1970s disco shirt. 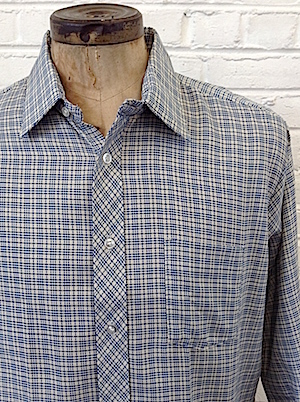 This groovy disco shirt comes in a funky off-white and blue miniature windowpane plaid. Has a super wide & pointy disco era collar. Closes in the front with pearly white buttons with one matching button on each cuff. Shirt has one chest pocket and a tapered hem. Tagged by Designer Collection. Polyester/Cotton blend. Condition: Very Good. Has a few loose threads. Does not detract from the awesomeness of this shirt.